It’s now a little easier to reach for the stars on the StFX campus. 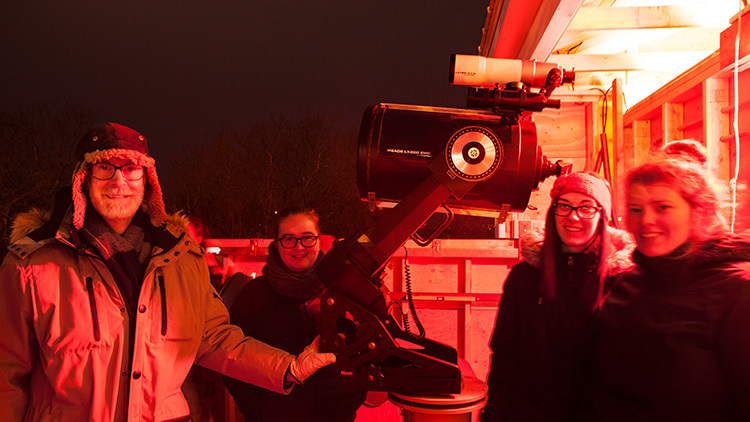 On January 29, StFX President Dr. Kent MacDonald was on hand to officially open the StFX Observatory, a new astronomical observatory located at 24 West Street across the street from Bishops Hall. “It’s exciting to have it come to fruition,” says Jamie Powell, senior lab instructor in the StFX Physics Department, who for years has been a driving force behind this initiative. Mr. Powell said many people have come together to make this happen, to reopen an observatory at StFX after an absence of nearly 15 years. “There’s a real sense of collaboration that has happened to get this to work,” he says. “A lot of people have put a lot of work into this. The benefit is for students, and also the local community. Everyone’s going to benefit from having this facility. This support has included the carpentry diploma class of 2017 at the Nova Scotia Community College in Stellarton under lead instructor Kevin MacIntosh who agreed to build the observatory, a 12 x 14 foot structure with a roll-off roof observatory; the support of Iain Boyd in StFX Advancement; Steve and Kathy Smith, former owners of Central Building Supplies, who donated the building materials; StFX Facilities Management who have done much work prepping the site and arranging for the observatory to be transported and installed; and Dean of Science Dr. Petra Hauf who arranged for a 20 x 16 building to be outfitted as classroom with power and a washroom on the site. The family of the late Dr. David Bunbury, a former StFX chemistry professor, donated his astronomy equipment, which will also be used for outreach, and Mr. Powell says solar panels and batteries that he and StFX faculty Drs. Peter Poole and Frank Comeau received through a 2012 Service Learning grant to power the observatory are now installed in that classroom to be used for service learning by engineering students to learn about solar energy and to make public presentations. Physics students will use the observatory, as well as students taking astronomy courses. and the general student population and local community will have access on public nights. Local schools and other special interest groups will also likely have opportunity to book time. The observatory also helps maintain the legacy of the late Rev. E.M. Clarke, a longtime physics faculty member, whose efforts led to the creation of StFX’s first observatory, a traditional style dome, erected on the roof of the old science building, now the Schwartz School of Business, around 1979-80. The observatory was used as a teaching instrument, for training students and for public outreach for over 20 years. Mr. Powell says he started looking after the telescope in the early 1990s and did so for about a decade until they had to dissemble the equipment around 2002-03 in preparation for the department’s move into the newly constructed Physical Sciences Complex across campus. From the beginning, he says they wanted to make sure StFX had an observatory again, a motivation to restore what we had. Over the years, different arrangements have been made, including an off-campus site and hauling equipment in and out of the new building. But none of these arrangements were ideal, until now. “I feel happy that it’s worked,” he says.